Get ready to burn fat, boost your metabolism, and get LEAN with ChaLEAN Extreme®, the new workout system that transformed everyone in the test group with 3 simple words: MUSCLE BURNS FAT®. It’s a fact. The more lean muscle you have, the more fat you burn. You can burn up to 60% of your body fat in just 3 months and see visible results every 30 days—GUARANTEED! Chalene Johnson’s proven technique shifts your fat-burning focus from cardio to resistance training. By adding resistance training in 3 phases, you’ll build lean muscle, and that’s what supercharges your metabolism so you burn fat long after your workout—even while you sleep! Chalene teaches you the proper form and technique for the resistance moves you’ll be doing in the program, whether you’re using weights or bands. You start lifting weights to jump-start your metabolism and break down those “extra” reserves of fat. In these moderate training workouts, you’ll work your upper body then lower body, and learn how Lean Phasing will help you see major results every 30 days! Chalene shows you how to lift heavy—beyond your comfort zone—so you build the muscle you need to burn fat. Chalene makes it easier than it sounds with incredibly fast results. Here is where you really bring it home with new routines and dynamic moves that literally melt the fat off your body. You will be blown away with jaw-dropping results and rewarded with a brand-new body! During each phase, Chalene ignites your metabolism with super-intense cardio and strength-training routines, and then rejuvenates and lengthens your hard-working muscles with an invigorating flexibility workout. Shrink, tighten, and tone your tummy with two targeted ab routines for a rock-hard midsection! 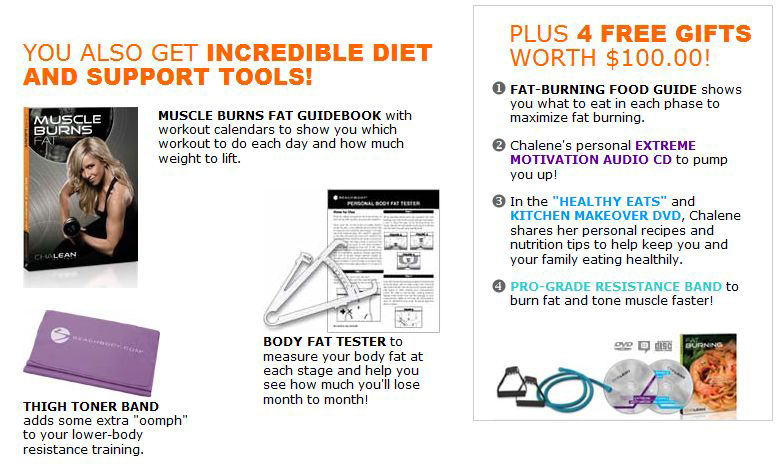 YOU ALSO GET INCREDIBLE DIET AND SUPPORT TOOLS! PLUS 4 FREE GIFTS! Chalene’s so sure you’ll be blown away by ChaLEAN Extreme, she’s giving you her 90-day money-back guarantee. If you’re not 100% satisfied for any reason, just call Customer Service to return it within 90 days for a FULL refund of the purchase price, less s&h, but the FREE gifts worth $100.00 are yours to keep!